Our top model Scamper S600 XL e Read more..
Our top model Scamper S600 XL exudes strength and flexibility. The bike is equipped with various comfortable features such as a front suspension, sprung seatpost and a smooth mid-engine. The frame has a low entry height and is equipped with sturdy folding hinges and a powerful and efficient Panasonic battery. With this you easily reach a range of 60km and when you use an extra capacity battery even up to 100km (ask for the possibilities) The bike is built so that it can be folded in a few steps and is easy to store in your car, boat, camper or caravan. The SCAMPER S600 XL is equipped with 24 inch wheels. The bike is slightly higher, but almost all specifications are comparable to the standard model S600. This also makes him unique in its class. A ring lock, suspension seat post and a rust-proof chain is included with this bike. The Scamper S600 XL with midmotor provides a very powerful support in every situation, such as long distances, against the wind or against hills. The 250W motor from Bafang is powerful enough and very reliable. In combination with the 7 Shimano hub gears, the Scamper S600 XL has a very natural cycling experience with electric support. The front wheel is euipped with a disc brake, the rearwheel with rollerbrake. The Scamper S600 XL is standard equipped with a sprung seat post and an RST fork suspension for more comfort while riding. Because of the 24inch wheels the bike is a bit higher compared to the “normal” S600. These larger wheels do provide a more stable riding experience. 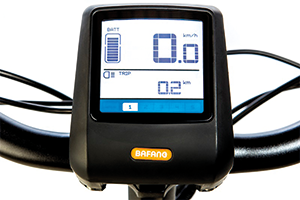 The front LED light uses the bicycle battery and is easy to operate from the control unit on the steering wheel. The Scamper S600 XL is equipped with a 12AH/36V Li-ion Polymer battery from Panasonic that is light, powerful and durable. The 12AH battery has a standard range of up to 60Km (100Km with a higher capacity battery). The battery is removable and can be locked. A charger is included with the bike.